uuid : 9ed342b5-a5a6-428a-9097-8bb306e9ffa9 templates_id: 119532 templates_uuid: "8ed47056-9834-4fd0-83d6-dc033b94f47b" title: "Dismissal Letter for Poor Performance - Poor Performance Dismissal Letter" display_name: "Dismissal letter for poor performance" meta_keywords: "Poor performance dismissal letter" description: "
Make sure you do things right when you want to dismiss an employee following a poor performance process with this dismissal letter for poor performance. This dismissal for poor performance letter details the process to be followed when dismissing an employee, who is protected from unfair dismissal, for poor performance. What is a dismissal letter for poor performance? A dismissal, or termination, letter for poor performance is a letter informing an employee that they are being dismissed on grounds of poor performance following prior warnings. It outlines the reason for dismissal and details the arrangements to terminate the employment. Why do I need a dismissal letter for poor performance? Issuing a formal dismissal letter for poor performance ensures you follow the proper disciplinary process. Outlining in writing the reasons for dismissal protects the employer against the risk of unfair dismissal claims and reduces the likelihood of further disputes in relation to the dismissal decision. Should there be a hearing before dismissing someone for poor performance? Dismissal for poor performance should be the final step of the disciplinary procedure. The ACAS Code of Practice on Disciplinary and Grievance Procedures says that, except in cases of gross misconduct, you can only dismiss an employee after at least two warnings (or performance management discussions) and a disciplinary hearing. If the employer fails to follow this process and the employee successfully brings a case for unfair dismissal in court, the employment tribunal might award an extra 25% compensation to the employee. Is the dismissal effective immediately upon receipt of the letter? Depending on the terms of the employment contract, the employer can make a payment in lieu of notice (PILON), allowing dismissal to take effect immediately, ie on the date of receipt of the letter. The employer may also make a PILON at the employee\302\222s request, provided that the parties mutually agree on it. If no PILON has been agreed on, employees are entitled to whichever is longer out of the notice of termination of employment stated in their contract of employment or statutory minimum notice. Statutory minimum notice is one week for each completed year of service, subject to a minimum of one week and a maximum of 12 weeks. Can an employee appeal a dismissal for poor performance? Offering the right to appeal dismissal is an important part of a legally fair dismissal process. The contract of employment or the business\' disciplinary policy usually indicate what the deadline for appeals is. If no deadline is specified, the employer should give a reasonable period such as 14 days.
" created_timestamp: "2018-10-08 04:36:42.0" modified_timestamp: "2018-10-08 04:36:42.0" active: true created_by: 236 modified_by: 236 dcm_id: 258 url_slug: "Letter-dismissing-an-employee-following-poor-performance-process" meta_description: "Create a dismissal letter for poor performance with simple guidance from Rocket Lawyer. Make sure you do things right when dismissing an employee for poor performance. Try this dismissal for poor performance letter." time_to_complete: "10 minutes" role1: "Employer" role2: "Employee"
Depending on the terms of the employment contract, the employer can make a payment in lieu of notice (PILON), allowing dismissal to take effect immediately, ie on the date of receipt of the letter. The employer may also make a PILON at the employees request, provided that the parties mutually agree on it. Offering the right to appeal dismissal is an important part of a legally fair dismissal process. The contract of employment or the business' disciplinary policy usually indicate what the deadline for appeals is. If no deadline is specified, the employer should give a reasonable period such as 14 days. More than just a Dismissal letter for poor performance template, our step-by-step interview and guidance makes it easy to create your document. 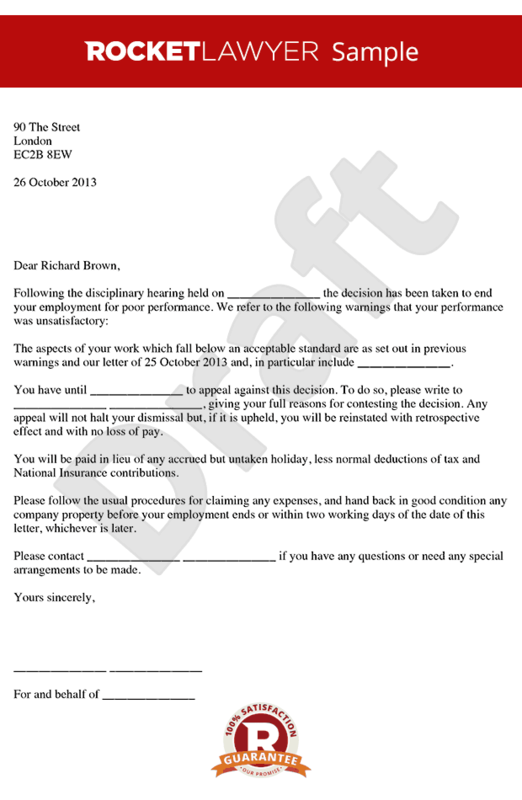 Easily create online, download, print and sign your free Dismissal letter for poor performance in minutes. This document is also sometimes called: Poor performance dismissal letter.